Fun chocolate gift ideas, small chocolate presents to send to family, friends and work colleagues. Unique chocolate gift ideas, send fun chocolate mini thank you gifts, surprise gifts, 'no reason' surprise presents for family and friends, 'well done' gifts for children or rewards for staff. Maybe a Cadbury Crunchie gift is her favourite or some Galaxy Milk Chocolate, perhaps they love a Cadbury Flake, a Bounty or he's partial to a Mars Bar or Snickers. Fun novelty chocolate presents to send to kids for birthdays, exam results, first day at school, college or uni, get well soon gifts or just as a special treat. Spoil someone, send their favourite chocolate as a fun, surprise gift, delicious chocolate chosen by you then carefully wrapped, packed and delivered by Takeaway Chocolate. Who would you give your last Rolo® to? Send a Rolo® treat to your family, friends or loved one today. Fun chocolate gift ideas for work mates, to reward staff, recognise sales targets, to thank teams and departments for hard work or to show appreciation to your clients. Choose a bar of Cadbury Dairy Milk to send to a loved one today. Yummy chocolate, fun ideas to send to kids as a special treat. Staff reward ideas for a job well done or hitting a sales target. 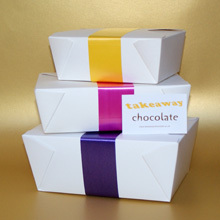 All Takeaway Chocolate gifts are carefully packed in a white takeaway box, wrapped in coloured tissue paper with a Takeaway Chocolate gift card personalised with your own message tucked under matching ribbon. Chocolate gift ideas available in three different size boxes, a Mini gift for a fun treat or choose the Extra size when you need a little bit more and there's our Sharing size, great for nights in with family and friends or for celebrations with colleagues at work. If you need help or have any questions please email hello@takeawaychocolate.co.uk. UK mainland delivery is £3.95 and your gift will be arrive in 2 - 3 working days. The delivery cost for your order will be shown clearly before you pay. We accept credit cards and other payment options using the security of PayPal. Popular chocolate bars packed in a pure white takeaway gift box with matching tissue paper then wrapped with bright coloured ribbon and a gift card with your message. Our chocolate gifts are available in three novelty chocolate box sizes, mini, extra and sharing. For pamper gifts to buy online visit Comfy Gift Boxes website www.comfygiftboxes.co.uk. Copyright © 2015 - 2019 Takeaway Chocolate. All rights reserved.